Biking to the beach, that is dedication. It also shows the true free spirit, living simply. Well Carver Surf Racks , is dedicated to just that, getting you to the beach, being green. The Carver Surf Rack Mini is small but strong enough for boards up to 8'0". 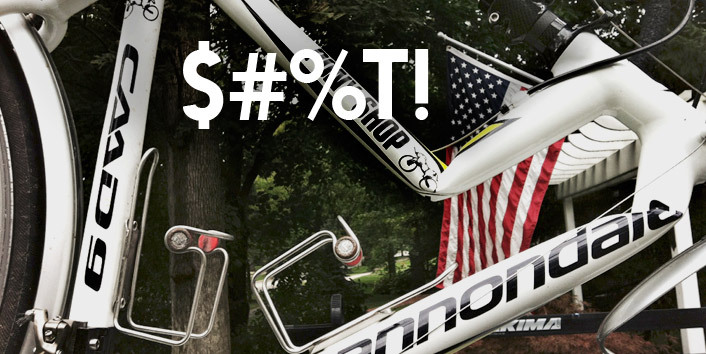 Unlike other brands, this surf rack mounts via the seat post as not to crush, scratch or mar your nice bike frame. Also this feature allows you to mount this surf rack onto mountain bikes, full suspension bikes, and bicycles with unusual frame tube shapes. In a never ending pursuit of innovation in protection, SIXSIXONE introduces Subgear. Subgear combines the advantages of anti-microbial compression top garment with the protection of Intella-foam and EVA foam. The result is the perfect undergarment for motocross. SubGear utilizes an anti-microbial 4-Way compression fabric called Dri-Kool. Wicks moisture off skin while keeping the rider cool, even on hot days. Strategic amounts of Intella-Foam are light and absorb sudden hard impacts more than traditional EVA foam four times its thickness. Flat-lock stitching eliminates irritating seams. The fear of falling is definatly present in this video, at the same time you keep wondering how amazing this must feel. Bike Rack Meets Garage, Not Any More! Some of have done this, some have done it multiple times and yes the description on the picture is about how you feel. Forget about putting a cone in front when you leave, stickers on the outside of the door as a warning, the Headsup system is your answer. Bikes. Kayaks. Roof-rack gear. The HeadsUp System is a new, smarter way to protect them all from getting racked. It's a garage-mounted wireless gear alert system that detects when you return home with gear on the roof. When HeadsUp senses your gear, the system alerts you to STOP - so you don't drive into the garage with your gear still on the roof. The HeadsUp System is a wireless system that keeps you and your gear from getting racked. Just one distracted moment coming home can cause thousands of dollars of damage to your gear, vehicle and garage, so let the HeadsUp System watch out for you. The system includes an LED alert sign that mounts in your garage, tiny wireless tags that go on your gear, and a wireless alerter that sits in your vehicle. When you return home with your gear on the roof, the alert sign lights up in your garage and the alerter sounds a tone inside your vehicle - reminding you to stop and unload your gear before driving into the garage! Check out Outside Magazines 2011 Bike Special. As everything gets tougher, the one thing that you can count on is being able to tinker with your own car, without any technical gear. Going into the garage turning the key and on goes the car, no checking the electronics, seat belts, airbags, simple.. 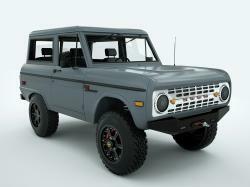 The Bronco is one of those simple american through back cars or trucks, before they called it an SUV. It is coming and coming fast. As most of us wind down are season so are the pro's, doing last minute races before moving to the island for a couple weeks. Not sure that is such a bad thing, Seems every year more pro's seem to spend a considerably more time on Kona before the race, can't say that I blame them. Spending more time on the island make you more accustom to culture and settings, no food problems hopefully. Note sure how it will all play out the field is stacked and everyone is lining up to be the next champ. Will it be Chrissy or Crowie, who just won his second 70.3 World Title. U.S. Needs more H2 Bike Run place. The U.S.A. needs more H2 Bike Run places. H2 was created by cyclist commuter Piers Slater who spent 10 years showering and changing in cramped offices and health clubs. Eventually tired of using poor facilities he decided to create a solution. Cyclist/runner commuters numbers were growing and there was a lack of bike parking or showering/changing facilities for their staff. He saw that a club providing these elements would not only prove attractive to the individual consumer market but could offer a solution for many corporate occupiers. Experts from the fitness and cycle industry were brought together and H2 was born. The team identified running and cycling as the fasting growing forms of exercise set about being instrumental in promoting outdoor fitness for cyclists and runners. Extras such as cycle repair, retail, dry cleaning and laundry service were introduced as well as running clubs and outdoor circuit training. Cycling and running is cool and H2 wanted to create a space that people aspired to be part of. Urban Reef were commissioned to design H2 Soho. The brief was to create an urban chic club that combined convenience and quality creating a sanctuary for our members. Technology and design ensure the customer can pass through the club as effortlessly and quickly as required or dwell and enjoy the ambience. Eighteen months of research and design brought together all the best elements of the fitness, hotel and retail sectors to create a truly unique product. The attention to detail in shower, locker and club design has been obsessive at times to ensure our product is the best. H2 Ride sit at the heart of the club providing the focal point and energy which the rest of the club draws from. H2 set out to give the member a premium product, a low cost entry level for membership, and, unlike many gyms, a completely transparent pricing policy and no contract. Slater states, “ Our vision is to create a product that is aspirational but available to all, we will have members who have a base membership at £27.99 and those who take the 5 star service with locker, dry cleaning ecetera, but both will experience, love and appreciate H2 with equal gusto. Customers have the flexibility to tailor H2 to their level of use and budget, that is what really excites us.” Technology has played a key part of this and the bespoke H2 membership system allows customers to manage their account and bookings online. The team identified that customers were fed up with paying for services in the gym they did not use and seeing the expansion of the budget gyms H2 identified a demand for a niche quality club. H2'ers pay a low monthly membership fee and buy credits for H2 Ride (£3 per class), Personal Training and Sports Therapy as they go. The gym and running club are included within the membership price starting from £19.99 per month. Slater said "it is quite simple, we operate our joining and booking online as far as possible reducing our sales costs and overheads which we pass on to our customers." Inspired by the Spinning® studios of New York, H2 met with Spin experts Sarah and Sandro Morelli. Their combined vision gave birth to H2 Ride – a dedicated room for Spinners® and cycle training, providing the best Spinning® experience London has to offer and taking the sport to a totally new level. Sarah Morelli enthuses, "H2 Ride is awesome, we cater for all levels competence and provide an adrenalin fueled experience which fits into your busy day." Slater finishes, "H2 Ride is out there, it is such a great fun way to exercise, we are already seeing huge demand and we have plans that will take it to new levels." The H2 team want to make a difference to how we commute and work out and invite you to join us on our adventure.